Great job, as always! Thanks very much for inspiring the third haiku in this haiku and tanka post. 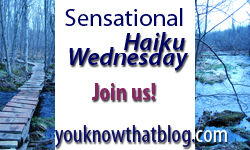 Great haikus – loved this subject it made me think more and was good fun too. This prompt nearly stumped me–until I figured out I could use “paradox” as the title for my haiku! these are haiku masterpieces, jenn… indeed, fear stops us from embracing change. it’s been awhile since i joined you here. i’m glad to be back. have a great day! So happy to see you back with us, Bing!! i LOVE your haiku. thank you for the opportunity to participate.